When the prior owners moved out, they left us several "gifts", as I've mentioned before. The most useful (and obvious) of these is the chicken stools. 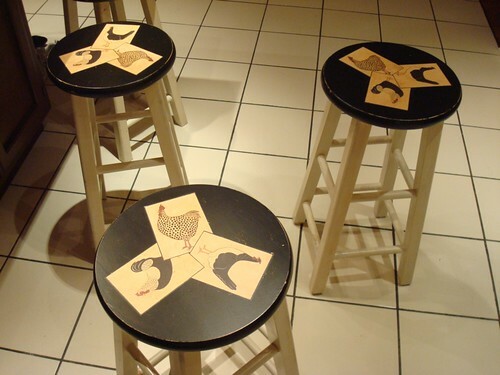 Now, they are very functional stools (despite a couple of broken struts), but really, we just aren't chicken people. Nor are we backless stool people. Someday we'll replace these with counter stools with half backs. Something comfortable, stylish, and decidedly chicken free.